In the context of recent discussions at the UN climate negotiations we compared several ways of calculating historical greenhouse gas (GHG) emissions, and assessed the effect of these different approaches on countries’ relative contributions to cumulative global emissions. Elements not covered before are: (i) including recent historical emissions (2000–2010), (ii) discounting historical emissions to account for technological progress; (iii) deducting emissions for ‘basic needs’; (iv) including projected emissions up to 2020, based on countries’ unconditional reduction proposals for 2020. Our analysis shows that countries’ contributions vary significantly based on the choices made in the calculation: e.g. the relative contribution of developed countries as a group can be as high as 80 % when excluding recent emissions, non-CO2 GHGs, and land-use change and forestry CO2; or about 48 % when including all these emissions and discounting historical emissions for technological progress. Excluding non-CO2 GHGs and land-use change and forestry CO2 significantly changes relative historical contributions for many countries, altering countries’ relative contributions by multiplicative factors ranging from 0.15 to 1.5 compared to reference values (i.e. reference contribution calculations cover the period 1850-2010 and all GHG emissions). Excluding 2000–2010 emissions decreases the contributions of most emerging economies (factor of up to 0.8). Discounting historical emissions for technological progress reduces the relative contributions of some developed countries (factor of 0.8) and increases those of some developing countries (factor of 1.2–1.5). Deducting emissions for ‘basic needs’ results in smaller contributions for countries with low per capita emissions (factor of 0.3–0.5). Finally, including projected emissions up to 2020 further increases the relative contributions of emerging economies by a factor of 1.2, or 1.5 when discounting pre-2020 emissions for technological progress. This Annex describes briefly the uncertainties of the dataset. For CO2 emissions in EDGAR 4 the overall uncertainty range in global total emissions was estimated at ±6 % excluding land-use related CO2 emissions and ±10 % including them (Houghton et al. 2012; Olivier et al. 2012). For global emissions of CH4, N2O and the F-gases uncertainty estimates of 25 %, 30 % and 20 % were assumed, respectively, which comply with global emissions estimates inferred from atmospheric concentration measurements (UNEP 2012). However, the uncertainty in the resulting EDGAR 4.2 FT2010 dataset may be substantial at national level. A synthesis analysis by Andres et al. (2012) of four global datasets (CDIAC, EDGAR, IEA, EIA) of CO2 emissions from fossil fuel combustion showed that global emissions are known to within ±10 % uncertainty with individual national total fossil-fuel CO2 emissions ranging from a few per cent to more than 50 %. In EDGAR the uncertainties are ±5 % for OECD countries and ±10 % for countries of the former Soviet Union and most developing countries (95 % confidence interval) (IPCC 2006). An analysis by Houghton et al. 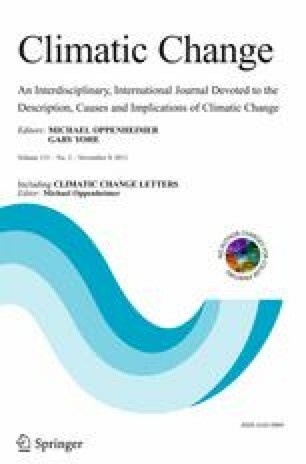 (2012) on recent global estimates of carbon fluxes from land use and land cover change, i.e. forest-related emissions, showed a very large uncertainty in global CO2 emissions of the order of ±50 %. In EDGAR 4, forest-related GHG emissions are represented by emissions from biomass burning and decay of biomass remaining after forest burning and after logging based on satellite detection of the areal extent of forests fires combined with biomass density maps to estimate emissions from deforestation based on the assumption that a large proportion of land clearing is by fire. At country level, clearing rates calculated this way capture up to about 80 % of the total clearing rates found by other approaches (Houghton et al. 2012). In addition, the EDGAR 4 data shown includes CO2 emissions from decomposition of organic carbon of drained peat land and from peat fires (Olivier and Janssens-Maenhout 2012). A comparison of the EDGAR forest and peat-related emissions with an updated regional ‘bookkeeping’ dataset provided by Houghton (2013, pers, comm. ), based on Houghton (2010), showed that total CO2 forest and peat-related emissions from the tropical regions as a group are comparable, but there are large differences for specific tropical regions (for most up to 80 %). The temperate regions data of Houghton are not comparable with EDGAR data since the latter does not include the sink term of land-use change: the increase of the carbon stock in living forest biomass due to maturing forests and regrowth of forests. Based on the EDGAR country estimates, we estimate the emissions at individual countries for the Houghton dataset, and explored the impact of using this dataset instead of EDGAR on the relative contributions of countries. It shows that for most countries the contributions changes by a factor of 0.9–1.1, except for some developing countries with high deforestation emissions (Asia: 0.8; Brazil 1.3; Indonesia and Nigeria: 0.5) and Australia & New Zealand (2.4). Thus, for land-use related CO2 emissions from individual countries we estimate the uncertainty in the EDGAR data for annual emissions to be in the order of about ±100 %, set aside temperate countries, for which EDGAR does not estimate the relatively important sink component. Using the IPCC (2006) guidelines for activity data and emission factors for CH4, N2O and F-gases, the uncertainty in countries’ emissions are estimated about ±50 % for CH4, −50 to +100 % or more for N2O and more than 100 % for F-gas emissions (Olivier and Janssens-Maenhout 2012). Comparing the EDGAR national emission totals for individual countries with emissions officially reported to the UNFCCC show smaller uncertainties. Analysis showed average differences of 25 % for CH4 and 20 % for N2O for the group of 38 industrialised countries with a standard deviation of 20 % for CH4 as well as N2O, although the uncertainties in annual emissions of most sources of N2O are very large and may sometimes exceed 100 % (e.g. for some agricultural sources) (UNEP 2012). The estimate of 7 GtCO2eq of ‘subsistence allowances’ for ‘basic needs’ represents about 15 % of present (2010) global anthropogenic GHG emissions, and its composition of this amount can be envisaged in various ways. One example of how this total could be constructed using EDGAR 4.2 estimates for global sectoral emissions, acknowledging that present global emissions are the result of very different levels of economic development and local geographic and climate conditions, would be the sum of: CO2 emissions from fuel combustion in residential and agricultural sectors; CH4 and N2O emissions from rice production, livestock excluding cattle; 10 % of CO2 emissions from fuel combustion for power generation, road transport and industrial manufacturing; 10 % of CH4 emissions from gas transmission, cattle and waste; 10 % N2O emissions from industrial production, road transport, synthetic fertiliser use and cattle.